"While I'd definitely favour the bigger hitters, length off the tee is clearly not imperative, despite the yardage of the course." The D+D Real Czech Masters was first staged in 2014 so this is only the fifth renewal and for the fifth year in-a-row we return to the Albatross Golf Resort in Prague. Designed by Keith Preston and opened in 2010, the Albatross Course has been the host course since the event began. It's a long track with average width bentgrass and fescue fairways and bentgrass greens. The greens usually run at around 12 on the stimpmeter. There were a couple of changes to the course before the 2016 renewal. Two new green side lakes were added, on the first and 12th holes, a new lake was added to the left of the lay-up area on the 10th and 27 new trees were planted and the changes look to have had some sort of effect. Thomas Pieters won the 2016 edition with a 20-under-par total but Haydn Porteous could only reach -12 last year, 12 months after Paul Peterson won in 15-under-par. In addition to hosting this event for the last four years, the Albatross was also the venue for the Prague Masters on the Ladies European Tour in 2011 and 2012. For more on the course, please see this course map on the venue's website. What Will it Take to Win the D+D Real Czech Masters? The Albatross is a lengthy course and three of the four course winners have been long hitters. In the inaugural event, the classy Dane, Søren Kjeldsen, finished tied for third, having ranked only 64th for Driving Distance, but the majority of the top-12 ranked highly for DD and the first and second a year later, Thomas Pieters and Pelle Edberg, ranked first and second for Driving Distance, and Robert Dinwiddie was the only player in the first seven to rank any worse than 19th for DD. The first two tournament winners, Jamie Donaldson and Pieters, played the long holes better than anyone else in 12-under-par but it was all change in 2016. The winner, Paul Peterson, ranked second for Par 5 Scoring but in contrast to the other three winners, Peterson only ranked 40th for DD and his victory was down to accuracy rather than length - he ranked third for Driving Accuracy and first for Greens In Regulation. The defending champ, Pieters, who finished second to Peterson in 2016, ranked third for DD, but the third, fourth, fifth and sixth placed players ranked 44th, 62nd, 55th and 41st for DD and it was a similar story 12 months ago. The notoriously long Haydn Porteous won the event, ranking ninth for DD but Tom Lewis in a tied for third, who ranked eighth for DD, was the only other player in the top-eight to rank any better than 39th so while I'd definitely favour the bigger hitters, length off the tee is clearly not imperative, despite the yardage of the course. All four winners have putted really well - ranking fourth, first and second twice for Putting Average - and it's been all about making lots of birdies. The first two winners made more than anyone else, Denmark's J.B Hansen was the only man in the field to make more birdies than the winner, Peterson, in 2016, and the first and second 12 months ago ranked first and second for birdies made. The Birdies stat on the European Tour website here may well be of use but caution is advised. The first five in the list have played few rounds so the rankings are a bit skewed. The short answer is no. We've had a Welshman, a Belgian, an American and a South African winning so far and the four have varied in price too. The inaugural winner, Donaldson, went off at 12/1, Pieters was backed by a few shrewdies from [95.0] to [70.0] at the off in 2015, the 2016 winner, Peterson, was impossible to spot before the off and was matched at [1000.0] and last year's champ was a well-backed [55.0] chance. The first three home in the 2015 edition were all tied for third after round one and just one off the lead after opening rounds of 66 and they occupied the first three places at halfway. A year earlier, Jamie Donaldson had never been outside the first two places at any stage when he won so after the first two editions it looked like it might be a hard place to play catch-up but Peterson came from miles back to win in 2016. The unheralded American trailed by eight strokes at halfway before he broke the course record on Saturday and then shot the joint-best round of the day on Sunday to win by a stroke. Last year's winner was neither bang up with the pace or miles off it. Porteous trailed by four after round one, five after round two (although he'd moved up from 27th to fourth) and he trailed by two with a round to go. If you're betting in-running, beware the par four 17th hole. In the first four editions it's ranked either the hardest or second hardest on the course and a par there is a good score. Last year it averaged 4.25. After a lean year, the 2015 winner Thomas Pieters is finishing the season strongly as he bids to force his way in to Thomas Bjorn's European Ryder Cup side. A sixth-placed finish in the Scottish Open was followed by a respectable 28th in the Open Championship and his impressive tied sixth in the US PGA Championship last time out suggests he's a very worthy favourite around a track that clearly suits. 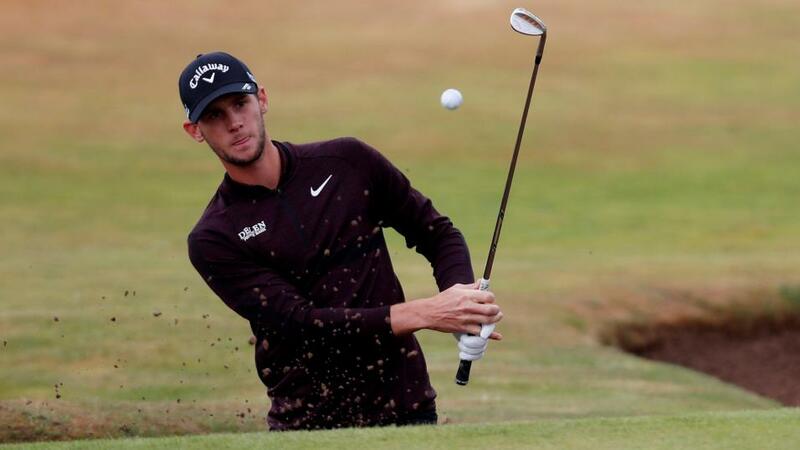 Pieters missed the cut here on debut in 2014 and he finished down the field last year when out of form but he was very unlucky to bump in to an inspired Paul Peterson having the weekend of his life two years ago and he could very easily be lining up this week in search of a hat-trick of Czech titles. I'm happy enough to leave him out at around the 6/1 mark but given the strength of the field, his current wellbeing and his obvious suitability to the venue, it's not too short a price. Eddie Pepperell is trading much shorter than he's done for much of his career but that makes perfect sense. He's twice finished inside the top-five here (in 2014 and 2017) and prior to his 59th in the US PGA Championship, he'd finished second in the Scottish Open and sixth at the Open Championship. His chance is obvious but given I backed him at [80.0] when he won his only title to date in Qatar in February and I backed him at [120.0] in the Scottish Open, taking [18.0] about him just doesn't compute. And the same can be said of the third favourite, Matt Wallace. Matt was alongside Eddie in my Scottish Open portfolio at [130.0], and that was after I'd backed him at [44.0] when he won the BMW International Open at [44.0] so taking just [23.0] about him doesn't feel quite right, although I'm not at all convinced the price is wrong. Matt has been going off at some very fancy prices and despite his three European Tour wins, people seemed to be oblivious to his game and Americans, in-particular, seemed unaware who he even was (note the incorrect name in the below clip) but Wallace's under the radar days look behind him for now after he did this at the US PGA Championship. I'm quite keen on the chances of the defending champ, Haydn Porteous, who's my each-way selection this week and my only other play before the off is another South African, JC Ritchie. The 24-year-old Pretorian is having a great season and he arrives here after a win and a third on the Sunshine Tour. His two main attributes are power off the tee and putting so he looks a great fit for the venue. I'm taking a bit of time off this week but I'll be back with the In-Play Blog later in the week - either late on Saturday or early on Sunday before the final rounds of both this event and the Northern Trust.